Every champion deserves a symbol worthy of their victory. Following the exciting conclusion of the 2011 International, we began work on an award to honor the names of the tournament’s victorious. We knew that such a prize needed to be substantial in both size and character, and that it should be able to carry the names of future champions for years to come. Having seen the superb craftsmanship of the weapons and props for The Lord of the Rings emerge from the hands of the artists at Weta, we felt it was a natural decision to approach the Academy Awards-winning physical effects studio to create the grand prize for the International. Weta has an unparalleled talent for taking fantasy and transforming it into reality. Our design brief to Weta consisted of a fully rendered 3D model of the Aegis of Champions, complete with conceptual artwork and several ideas to work from. 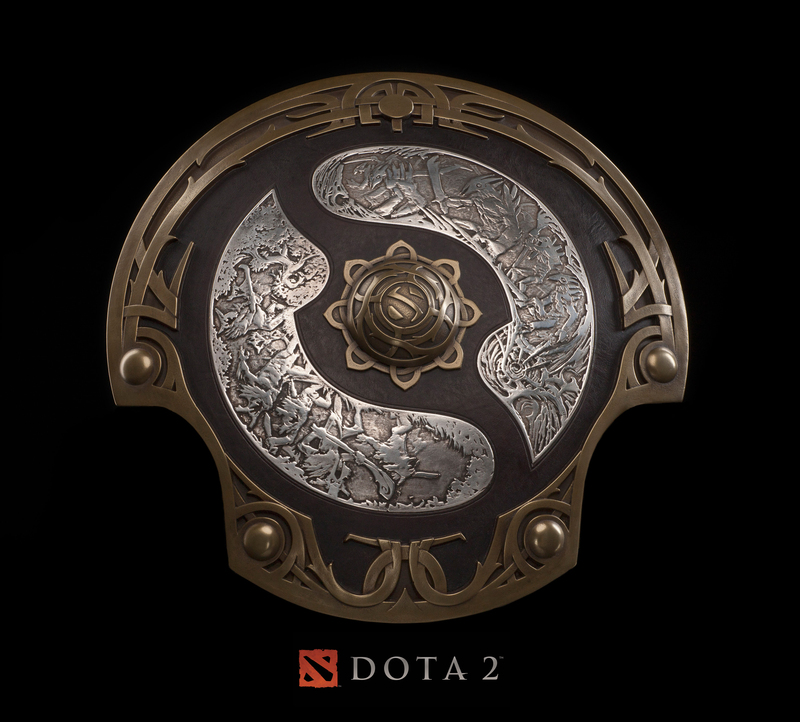 The goal was to create a stunning bronze and silver artifact that would look at home in the world of Dota 2 while also acting as a historical record of the tournament’s victories. We also wanted it to be something that would be useful in a sword fight (as sword fights happen a lot around the Valve offices). Inspired by Norse and Chinese design themes, we intended the shield to feel as eclectic as our hero line-up while still maintaining a sophisticated and clean overall design. 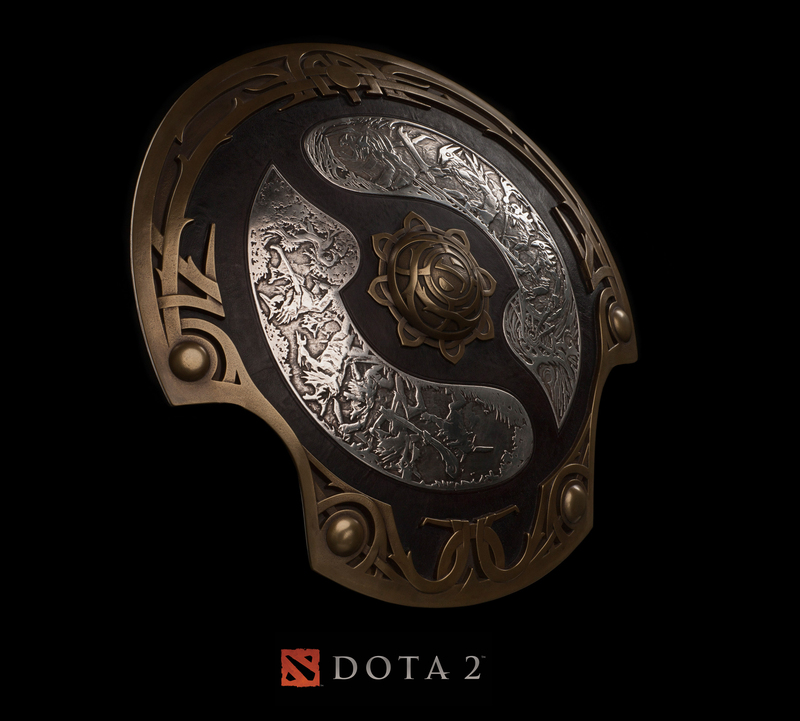 Since the Aegis is both a functional shield and a trophy, its circular silhouette is broken by a pair of concave indentations allowing a for a natural grip when the victorious hold it over their head. 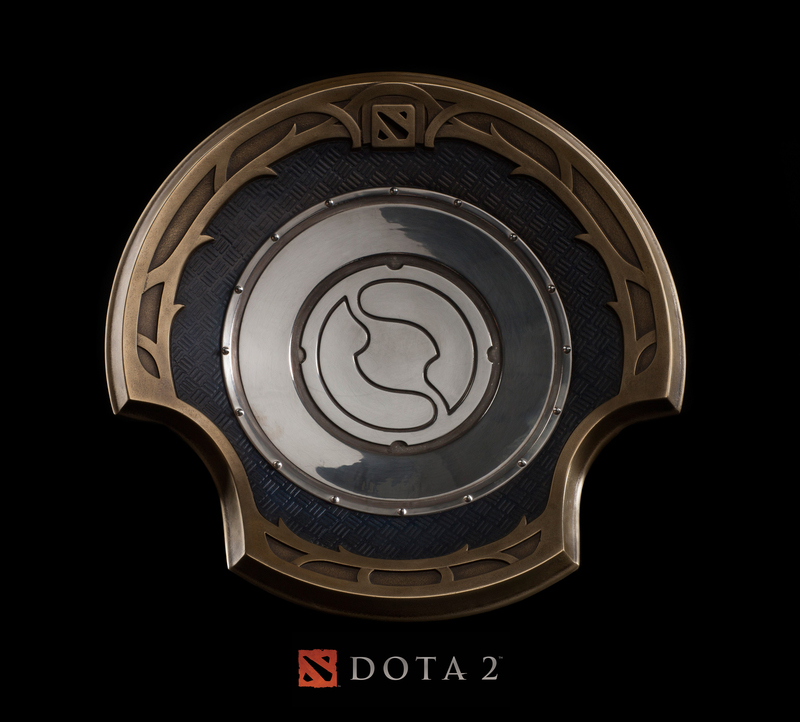 The most striking feature of the Aegis of Champions is its central relief, which depicts the constant struggle between the Dire and Radiant forces. The result is a unique object of profound beauty that is truly worthy of celebrating, and protecting, the best of the best. staking level of detail and collaboration. Once the size had been determined, it was time to prepare the 3D model for the CNC milling machines. This is a process Weta uses often to produce a physical object from a 3D file. From a solid piece of tooling board emerges a fully formed physical object, albeit still a bit rough around the edges. Even if the end result is a one-off, as is the case with the Aegis of Champions, the development process often requires up to 10 copies to be made for approvals purposes, different stylistic treatments and comparisons. Once everything is finalized, the completed Aegis is made ready for presentation. 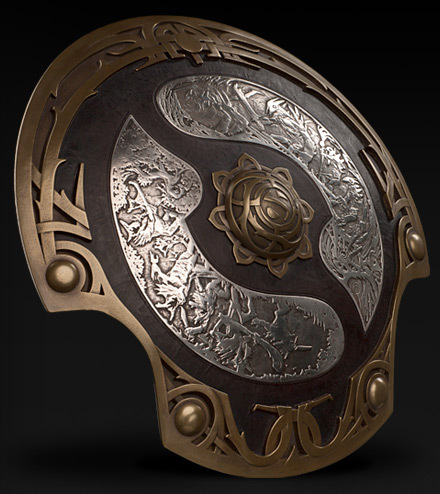 The finished Aegis of Champions was assembled from a variety of materials chosen for their strength and beauty, creating an enduring trophy for the Dota 2 community. The bulk of the shield is cold cast bronze which has been inlaid with hand-tooled leather. The central battle motif is surrounded by cured dragon’s skin, and made from pure electroplated silver. On the reverse is affixed the winners’ plaque, large and circular, pressed from a single sheet of Sterling silver and engraved with the names and handles of each player on the winning teams. After pouring more than three hundred hours of passion and creativity into the Aegis of Champions, the ultimate prize for victory in the International was finally complete. We are very proud of the work and energy Weta has put into producing this iconic symbol for the Dota 2 community. The 2012 International crowned a new champion with Invictus Gaming (iG). Beating last year’s champion Natus Vincere (Na’Vi) three games to one to win the Aegis of Champions. The exciting final match wasn’t the only highlight, we have daily recaps available here – Day 1, Day 2, Day 3. In addition to The Aegis of Champions, Weta will also be producing exceptionally detailed replicas of Vanguard, Butterfly and Demon Edge, as well as a statue of the hero Axe. These collector’s items, brought into our world by the skill of Weta artisans, are now available for pre-order. As a grunt in the Army of Red Mist, Mogul Khan set his sights on the rank of Red Mist General. In battle after battle he proved his worth through gory deed. His rise through the ranks was helped by the fact that he never hesitated to decapitate a superior. The tales called Butterfly a blade of betrayal, for it is said that in the hands of the uncertain, swinging the sword brings with it a promise of disaster. To use the blade properly it is said one must trust it completely, allowing it to wield the user. Demon Edge has passed from hand to hand, though only a hero may carry her for long. For in this single weapon, the warring Ancients vie. What lesser mortal can hope to wield such power? The hellwether emblem of the Vanguard is familiar to all who fight and bleed in the contested lands. Inscribed with ancient runes of protection, this shield of the Vanguard was discovered to provide its bearer with magical protection against damage.